This work examines N use by switchgrass (Panicum virgatum L.). 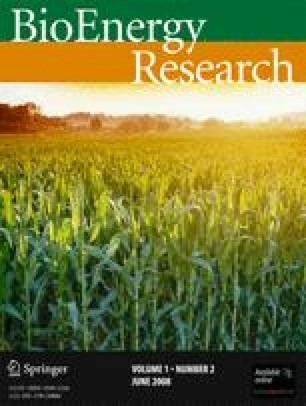 A study was conducted on two well-established ‘Cave-in-Rock’ switchgrass stands in Blacksburg (37° 11′ N, 80° 25′ W) and Orange (38° 13′ N, 78° 07′ W) Virginia, USA. Plots were fertilized in 2001 (year 1) with 0, 90, 180, or 270 kg N per hectare. No additional N was applied in 2002 (year 2) and 2003 (year 3), and biomass was harvested in July and November for years 2 and 3 (but only in November of year 1). Root and soil samples were collected in May, July, September, and November each year and analyzed for N. Nitrogen fertilization did not increase yields in 2001 (year 1), but it did provide residual benefits in 2002 (year 2) and 2003 (year 3). Root-N levels at 15 cm depth increased with fertilization, fluctuated seasonally between roots and shoots, and root-N was reduced over the course of the study. With two harvests per year, about 100 kg N hectare per year were removed in biomass, even in plots with no N added—suggesting N already present in the soils (at 15 cm depth) contributed to yields; but the soil mineral-N pools were reduced by the end of year 3. Nitrogen-use efficiency, apparent N recovery, and partial factor productivity were reduced with higher N applications. The data support the notion that biomass production can be achieved with minimal N inputs, but stands must be managed to maintain that N reserve over the long term. There is also a need to quantify the N pool to depths greater than 15 cm in other agro-ecoregions. This research was partially funded by the Department of Energy’s Biofuels Feedstock Development Program at Oak Ridge National Laboratory managed by University of Tennessee-Battelle, LLC. The authors would like to thank Dr. Dale Wolf, Dr. Gaber Hassan, Dr. Christine Anderson-Cook, W.T. Price, David Starner, and Steve Hutton for their valuable assistance with this project.